It’s officially summer in Chicago, and you’ll start to notice a plethora of begonias, impatiens, marigolds, cannas, dahlias, and elephant ears, all planted for a temporary taste of the tropics. If you’ve dreamed about creating an exotic vacation look at home, but wanted to reduce your yearly investment in annuals, consider pairing them with tropical-looking hardy perennials that come back yearly. The following additions will help give your garden that south Florida feel. 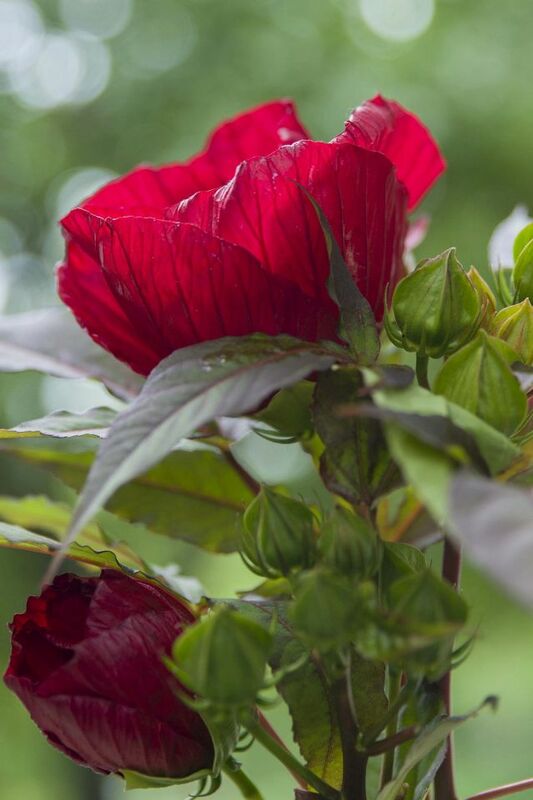 You don’t have to live in Hawaii to grow hibiscus. There are actually two species native to Illinois. Several others occur in the southeastern states. These hardy plants emerge late in the spring, get quite large and shrubby, bloom their hearts out in late summer, and then retreat underground when winters comes along. Midnight Marvel is a spectacular hybrid with very deep wine-colored foliage and dinner-plate-sized crimson flowers. Each flower lasts just a day a two, but are so plentiful that the show lasts for weeks, and hummingbirds love it. After each flower passes, the light green calyx tubes look pretty set against the dark leaves. Midnight Marvel reaches 4 to 5 feet tall, so is best placed at the back of the bed in a site with full sun. Orange is a hot color, perfect for a tropical garden. 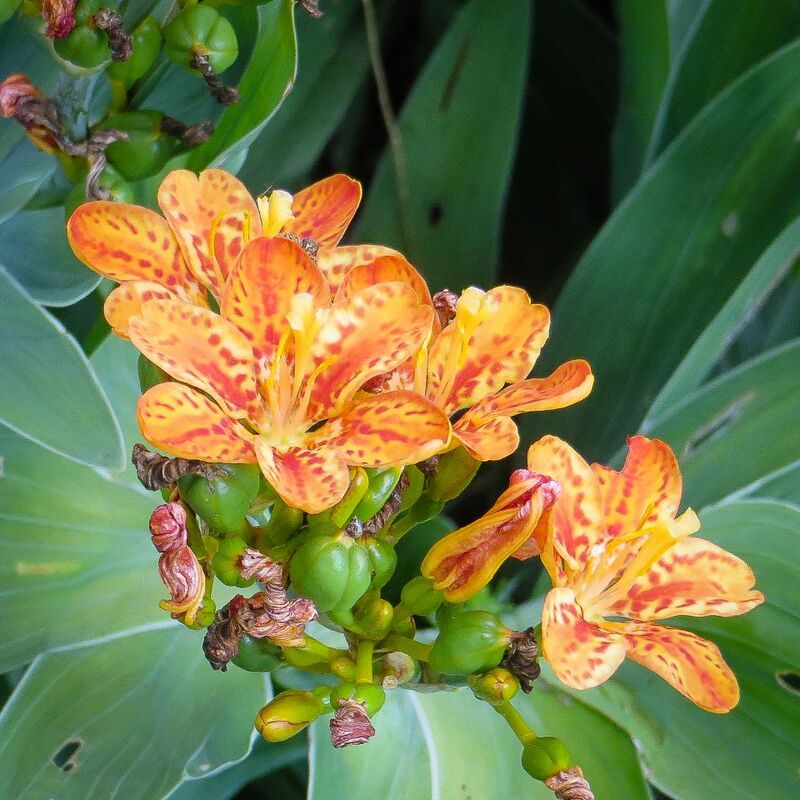 The flowers of Freckle Face blackberry lily (Iris domestica ‘Freckle Face’) are a gorgeous carroty shade with many vivid red spots covering each petal. The blackberry portion of the name refers to shiny black seed clusters that pop out of the split open pods. Sprays of flowers bloom for several weeks in late summer on these 2-foot-tall plants. Despite its name, this plant isn’t actually a lily at all, but resides in the iris family. The blue-green spiky leaves even resemble bearded iris foliage. Taxonomists very recently changed the name, so when searching online, you will most likely find it under Belamcanda chinensis ‘Freckle Face’. Here’s a statuesque perennial for the part-sun area of your tropical garden. An enormous specimen, reaching 6 feet tall and 3 feet wide, Sun King udo is mistaken for a shrub, but is completely herbaceous. 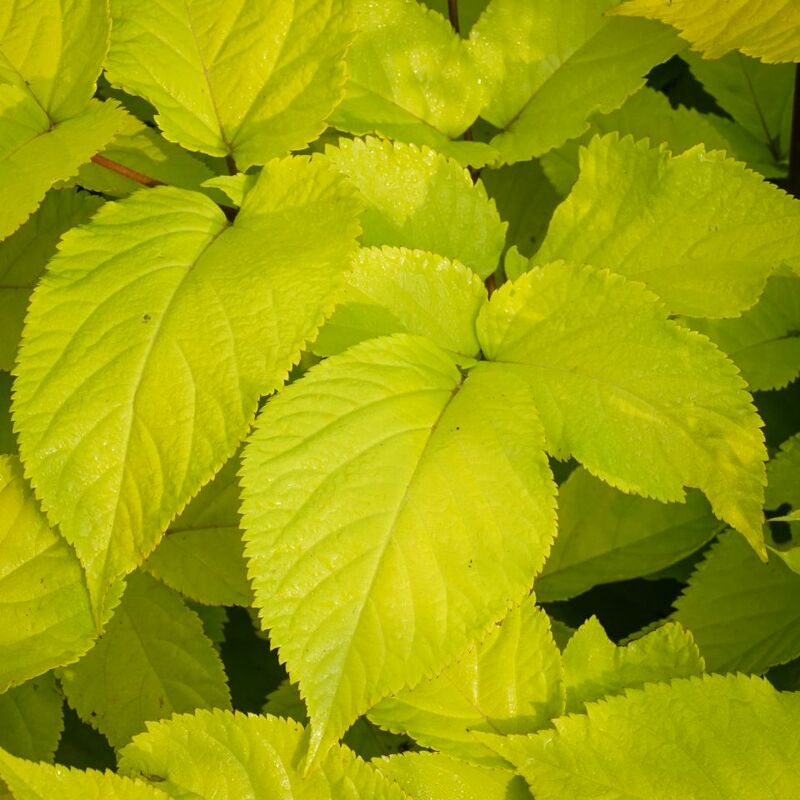 This is definitely a shade plant, but providing it with just a few hours of sun will really enhance the gold color of its foliage. In summer, Sun King udo’s many umbels of greenish-white flowers are total bee magnets. By autumn, the spent flowers have changed into densely fruited clusters of wine red berries. The fruits are attractive, but best left for the birds, since they are not remotely tasty. If you’ve got shade, consider mixing bold and tropical-looking foliage for a jungle effect. The perfect non-invasive perennial for this is shieldleaf rodgersflower. 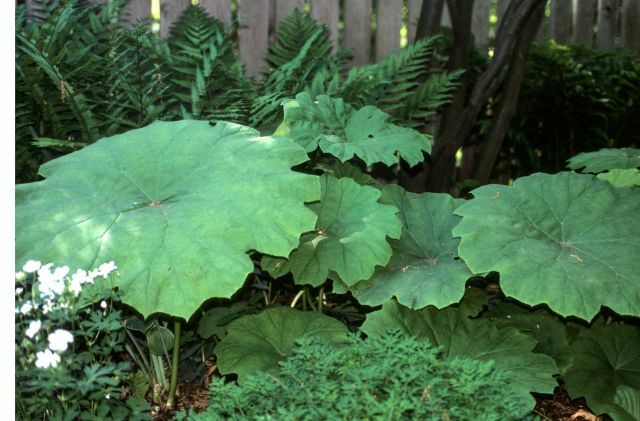 Formerly in the genus Rodgersia, Astilboides tabularis produces gigantic 2 to 3-foot-wide parasol-like leaves. While the leaves are the most striking part, creamy-white astilbe-like flowers do sprout up through the dome of foliage in late June. With enough moisture, the foliage remains light green and attractive until autumn. 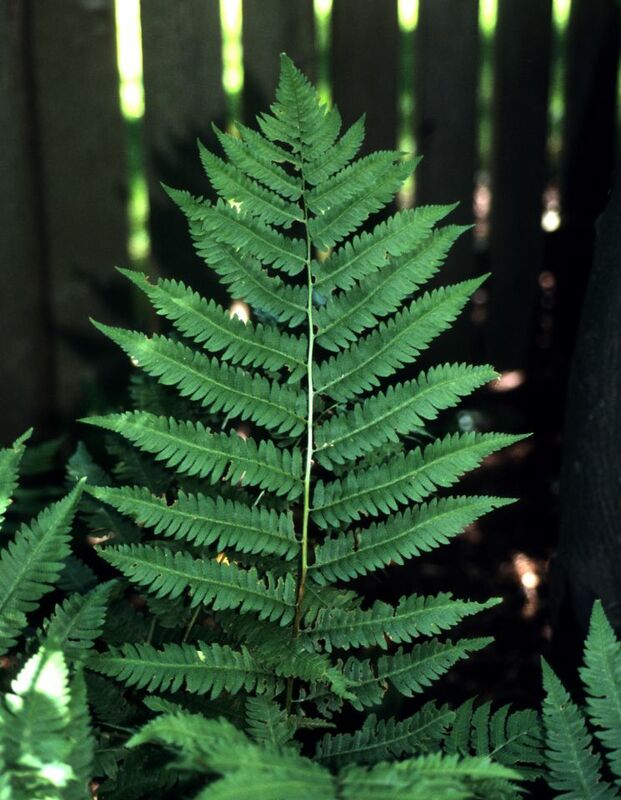 This is not a plant for dry shade or windy spots, but perfect for moist, rich soil. For additional large leaves in the shade, try Ligularia dentata ‘Othello’, Hosta ‘Sum and Substance’, and Rodgersia. The trick to getting the tropical look to work in your garden is to create a framework of dramatic, large-leaved perennials, and lacy, soothing ferns, then surround those with some hot red, orange, and yellow annuals. Top it off with some tiki torches, bamboo fencing, and a few lawn flamingos and you’ll have the perfect paradise for a hammock and mai tais!